Mark your calendar for Oct. 27 because history is going to be made. 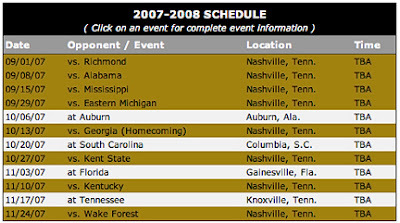 Look at the above schedules posted on the official sites of Illinois and Vanderbilt and you will see that each team is playing host to Kent State that day. Start times for the Golden Flashes' doubleheader in cities 377 miles apart have yet to be announced. This is one of the "scheduling issues" facing Mid-American Conference teams for the second year in a row. You might recall last year when Buffalo broke contracts with West Virginia and Rutgers to play games against Auburn and Wisconsin that resulted in bigger payouts. This year's mess is being blamed in part on Temple becoming a full-fledged member of the MAC. Word is that Temple at one point had scheduled five nonconference games. Only four are allowed. A tipster who wishes to remain anonymous said the MAC's scheduling issues might eventually result in repercussions for the league: "I'm not so sure that other conferences aren't looking at this and telling league members not to work with the Mid-American because of this mess." On Feb. 14, the Idaho Statesman reported that Eastern Michigan was trying to get out of a game at Idaho and that Boise State's schedule could be impacted by schedule problems involving MAC teams. On Feb. 17, the Honolulu Advertiser reported that Western Athletic Conference teams Hawaii and Boise State had unresolved scheduling issues involving MAC teams. Gary Richter, associate commissioner of the MAC, said his league was expected to announce its schedule "sometime next week." It didn't happen. On Feb. 21, the Lexington Herald-Leader reported that Kentucky's game at Temple had been dropped in favor of a home game against Kent State. The scheduling switch was done at the request of the MAC to resolve scheduling issues. Kentucky now has eight home games. On Feb. 27, the Detroit News reported that Bowling Green had been added to Michigan State's schedule and Western Michigan had been dropped. The Lansing State Journal reported the move was made "at the request of the Big Ten and to assist conference officials in resolving other scheduling issues between league institutions and other Mid-American Conference opponents." On Feb. 27, the Idaho Statesman reported that "another scheduling mishap in the Mid-American Conference" had resulted in Boise State agreeing on a home-and-home series with Southern Mississippi. The Broncos, eligible for a 13-game schedule because of a game at Hawaii, may play only 12 games because a game against Bowling Green was in jeopardy. On Feb. 28, the Muncie Star Press reported that Ball State's 2009 game at Indiana had been moved to 2007. The teams will play Nov. 3 at Bloomington. On Feb. 28, the Honolulu Advertiser reported that a planned announcement of Hawaii's schedule a day earlier did not materialize, further delaying a campaign to launch ticket sales. The report said Hawaii, with three open dates, had asked for help from ESPN to fill its schedule. On March 2, the Spokesman Review reported Idaho was replacing a dropped game against Eastern Michigan with another team from the MAC, Northern Illinois. On March 4, the Honolulu Advertiser reported that Western Athletic Conference officials were preparing to move ahead with its 2007 despite three openings on Hawaii's schedule. The story says that league hangups with the MAC had been resolved. In 2004, Bowling Green was scheduled to come down to Auburn for a non-conference game with the Tigers before breaking the contract to get a higher payout game with Oklahoma. The behavior detailed in this story is not surprising since the MAC schools need these payout games in order to sustain the budgets of their athletic departments. In 2005, the Div III Northwestern College Eagles played two games on the same day. ESPN has an article on the games. MAC athletic departments that are actually run by sentient beings aren't too happy about this either. The MSU thing is backwards. BG is playing at E. Lansing to replace WMU, at least according to MSU's site. Of course, the principle is still the same, and no less frustrating. 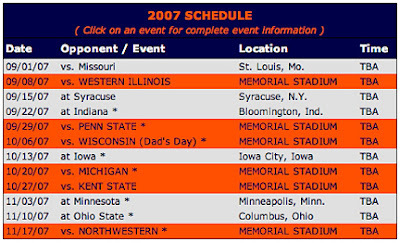 Bowling Green had home dates with Boise and Navy signed for 2007...now it's doubtful that those games will come off because our AD has apparently ceded his authority to schedule to the MAC office. An article in what passes for a newspaper in Bowling Green indicates that the OOC opponents for BG would come form a pool of teamms including Minnesota, Pitt, Indiana, Michigan State and Western Kentucky. Believe me...tha fans in Bowling Green are none to happy about this and there is grumbling from others that schools may be lookig to bolt from the MAC over this and other issues. Flipper, that pool of teams for BG's games also included Boston College and Boise State. Thanks for the correction Tony. The fix has been made. The (Ball State) Cardinals were supposed to play at West Virginia this year. Through a series of shifts by the MAC office, that game was released from Ball State’s schedule and probably will become part of Western Michigan’s schedule. Those schools are still working on contract details.